Peter Gubbels – co-founder of Groundswell International, believes so. He’s working with small-scale farmers across the Sahel’s dry lands in Mali, Burkina Faso and Senegal in an experiment with agroecological innovation that he hopes will improve food production and give farmers a better variety of food. Groundswell International champions agroecological farming, or in other words, family-farming the old fashioned way. This means sidestepping the one-size-fits all approach of industrial agriculture in favour of a greener approach that benefits farming communities. The idea in the Sahel is that farmers will share techniques with each other and local government will get involved to shape national policy. “We need forms of agriculture that are much more adaptable to diversify agriculture and minimise risk; use local resources, use agroforestry, use water conservation”. The processes of industrial agriculture, he adds - clearing land and rainforests and producing nitrogen fertilisers, emit greenhouse gases. Gubbels’ work in the Sahel’s dry lands is funded by the Global Resilience Challenge, which has awarded up to $1m for eight projects to build resilience in the Horn of Africa, the Sahel and south east Asia. It helps in other, less obvious ways too: improved soil fertility, rainfall better captured and managed, higher incomes for farmers, diversified farming systems that are more resistant to climate change, and more effective pest control. 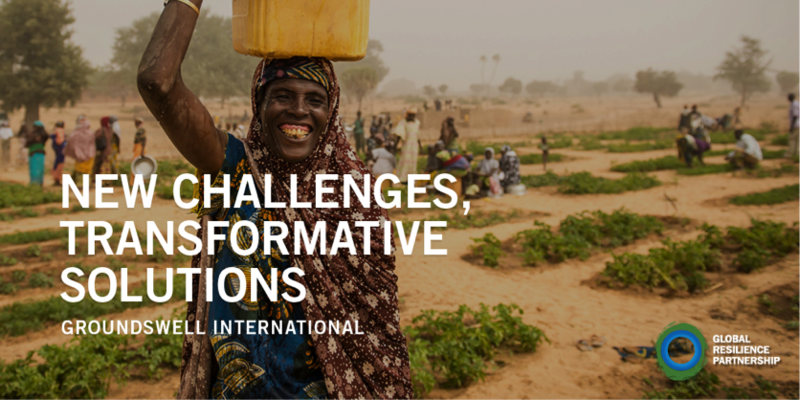 Running the Challenge is the Global Resilience Partnership (GRP), a public-private enterprise involving the Rockefeller Foundation, US Aid, and the Swedish International Development Cooperation Agency. Luca Alinovi, the GRP’s newly appointed executive director and former UN FAO head in Somalia, stresses the importance of harnessing the fertile ground between private business and innovation in tackling poverty and global warming. He tells The Guardian: “In the last couple of years, it has become possible for the social objective of a company to be its business objective. It’s an incredible gamechanger because if you can make money helping people who have been excluded from the economic environment become part of that environment, it’s the best way possible to make money,” he explains. “Most innovation is bringing about a dramatic decrease in costs of products and services so these are becoming affordable for communities of people who were not even considered potential clients”. However, what Alinovi really believes is needed to overcome the barriers to maximized innovation is a “coalition of goodwill”, involving NGOs, the UN, civil society and innovators. What do you think? Are you involved in agroecological farming? Do you think it can help to end world hunger? Read Clár Ní Chonghaile’s full article in The Guardian, here.